A brief summary of our projects, accomplishments and budget for the first half of 2018. Next Meeting - Monday, May 20 at 7PM at the Visitor Center. All are welcome. 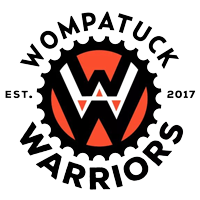 Wompatuck News #50 - Hot off the press and thanks to Wompatuck's historian Jim Rose, issue #50 of Wompatuck News - "NEMBA and the Burial Bypass Trail" - is here. You'll be looking at things you see in the woods differently after you read it. Pump Track - the Wompatuck Pump Track - built and funded by the FOW - is now open for bikers of all ages and skill levels. Find it near the Visitor Center parking lot. 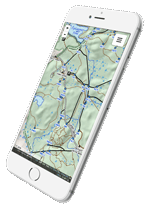 PDF Park Map - For printing or viewing online. Need a park permit for an event? 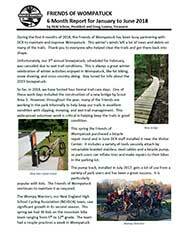 Wompatuck State Park is located in Hingham, MA - just 35 minutes from downtown Boston. Rich in history, this land was originally the property of Indian chief Josiah Wompatuck who deeded the land to English Settlers in 1665. During WWII and the Korean War it served as an ammunitions depot for the U.S. military. Today it is a 3,526 acre park that extends from Hingham into the neighboring towns of Cohasset, Scituate, and Norwell. For directions to the park or more information about Wompatuck State Park, visit the Massachusetts Department of Conservation and Recreation website. Support the Friends of Wompatuck while you shop at Amazon by accessing Amazon's website through our site here. A portion of your purchase will then be donated to FOW. Thank you!